Eric Wiater, Universtity of Maine, with one of their new Hitachi Z-HD5000 cameras. Here in the Athletics department at the University of Maine, the UMaine Black Bears compete in the America East Conference of NCAA Division I for all sports except hockey and football, which compete in the Hockey East conference and Colonial Athletic Association, respectively. We had previously performed some live video production using entry-level equipment, but when America East reached an agreement to bring our basketball games to ESPN3, we needed to upgrade to broadcast-quality equipment and workflows for the first time. At the same time, for sports not shown on ESPN3, we also wanted to start streaming matches to social media platforms including YouTube with similarly high production values. I had worked with Hitachi Z-HD5000 cameras in my own Communication Studies courses as a student at another college, so I knew they would be easy for the students to learn and operate. We purchased two of them, which we use on tripods to provide main game and close-up shots, and we plan to add two more as handheld cameras on the sidelines in the future. In addition to basketball, we use the cameras for baseball and softball coverage, requiring us to move the equipment between venues and set it up each time. The Z-HD5000s are super-quick and super-easy to deploy; the longest part is probably just carrying the equipment up the stairs. It takes us just 10 minutes to run the cables and set up, and it’s straightforward enough that I can trust the student operators to set up the cameras properly while I focus on other tasks. We take advantage of the single-cable simplicity of SMPTE fiber for connectivity, which lets us minimize cable runs by transporting video, audio and intercom signals over a single cable from each camera. The cameras are connected to half-rack width CU-HD1000 camera control units (CCUs) in custom flypacks. We use two 500-foot runs in our basketball venue, while for baseball, we use one 1000-foot run and one 250-foot run. 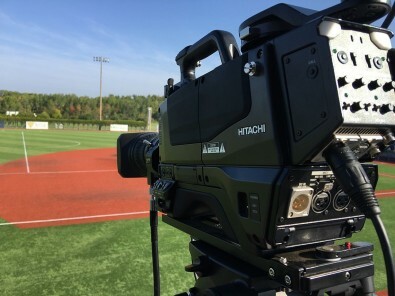 Maine University are using Hitachi Kokusai cameras for sports coverage via ESPN3 and for live streaming. We use Hitachi RU-1000VR compact remote control units to perform shading and color adjustments on the fly. We don’t need many changes during our indoor basketball productions, but we do need to adjust to changing outdoor lighting conditions with baseball. The new remote control capabilities have freed our camera operators to focus on the action, as someone else can now be doing the shading. The ease of use of the cameras has been very beneficial, as I don’t need to spend a lot of time training the users. Within 10 minutes I can have a student ready to work the controls and knowing how to make any changes I might need. The image quality we get is night and day compared to the cameras we had previously used, and the quality holds up very well even as available light diminishes, which is significant when we shoot outdoor sports. The cameras don’t need a lot of adjustment to look good in a variety of environments, which gives me peace of mind when I deploy them in the field. From a durability standpoint, the cameras travel around quite a bit and get bounced around, and they’ve held up great so far. This was our first year of producing baseball, which can be a very tough sport to shoot with a limited number of cameras. The combination of the Hitachi cameras and Fujinon lenses with 2x extenders has enabled us to get great-looking long shots of the outfield that we couldn’t get before, while staying within our budget. This coming year, we will be using the cameras to shoot an expanded array of sports, including soccer and field hockey. I’m also planning to bring them into a classroom setting, with a goal of teaching new video production courses in 2018. We rely on student operators for our productions, so in addition to giving students valuable hands-on experience they can use in the workforce, educating them will help provide an ongoing supply of crew members for our broadcasts. The Hitachi cameras have simplified the whole production process for us, taking a lot of the technical burden off the student operators so they can focus on the actual task at hand: great game coverage. From their visual quality and reliability to their ease of use, the result is that the cameras have made our overall productions much better in my book.